MSK President and CEO Craig Thompson (fourth from left) presents Hartford HealthCare President and CEO Elliot Joseph with the certification. They are flanked by leadership from both institutions. The certification comes after a year in which hundreds of experts worked together to assess standards of care at Hartford HealthCare Cancer Institute. 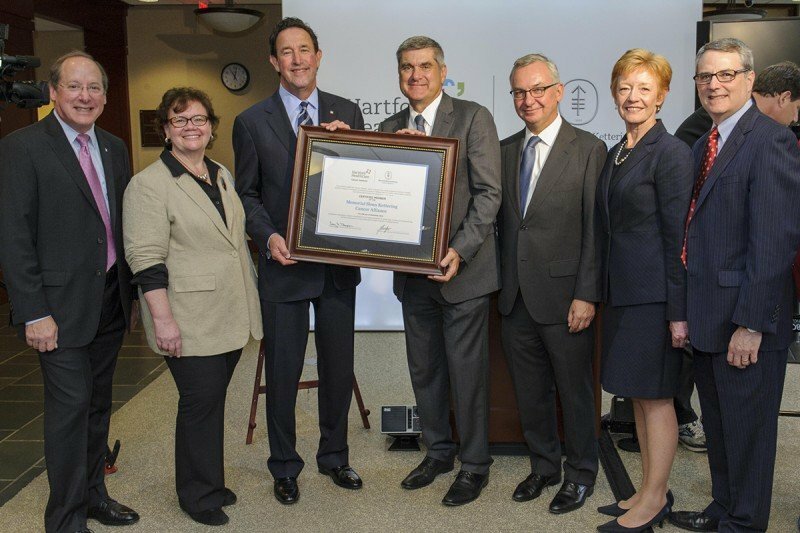 On Tuesday, more than 40 Memorial Sloan Kettering doctors, including President and CEO Craig B. Thompson and Physician-in-Chief José Baselga, traveled to Hartford, Connecticut, to celebrate the certification of Hartford HealthCare Cancer Institute (HHCCI) as a member of the MSK Cancer Alliance. The new initiative is designed to collaboratively guide community providers toward state-of-the-art cancer care. HHCCI’s certification comes after a year of rigorous analysis of six disease specialties (breast, colorectal, kidney, lung, prostate, and uterine — the most commonly treated cancers at HHCCI) spanning 11 different disciplines. Indeed, hundreds of experts from both organizations worked together to assess the resources and capabilities of the five cancer programs that make up HHCCI, with the ultimate goal of establishing a single, elevated standard of care across all five programs. In total, more than 500 doctors from both institutions collaborated over the course of a year to develop nearly 300 measurable standards of care. “At the end of the day, patients and their families are the motivation behind everything we do, and this means finding true alliances like the one we have found with Hartford to create real change in improving cancer care,” said Dr. Thompson. To mark the occasion, lung cancer expert Mark Kris co-led a continuing medical education program for clinicians that included physician-scientists Jedd Wolchok and David Solit; he also spoke at a community lecture open to the public. 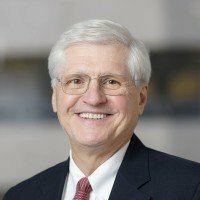 Both events focused on personalized cancer medicine, an area of innovation that has received particular notice this year with the launch of our Marie-Josée and Henry R. Kravis Center for Molecular Oncology, which Dr. Solit directs. Watch highlights from the event announcing certification. While certification was announced only this week, the collaboration with HHCCI has already begun to yield clinical results. For example, after having participated in observerships at MSK, HHCCI surgeons are now performing an imaging technique called sentinel lymph node mapping in women with uterine cancer. The method, pioneered by MSK surgeons, can improve quality of life for women with gynecologic cancers by helping to minimize the number of lymph nodes removed during surgery. And soon, select HHCCI doctors will participate in meetings of MSK’s disease management teams, the multidisciplinary teams of experts that come together to ensure that patients get the most comprehensive care possible. Among the many distinctive aspects of the collaboration still under way is the establishment of the first MSK Cancer Alliance clinical trials site, which will give HHCCI doctors the opportunity to offer MSK clinical trials to their patients in Connecticut. Learn more about the MSK Cancer Alliance. Dear Margaret, thanks very much for your question. Since each of the Hartford HealthCare hospitals in the Cancer Institute is multispecialty, patients will be seen in a regular ER. Cancer patients should go to the ER of the treating facility if they need emergency care. Thanks again for reaching out to us.